MGM, 1939. Directed by Edward Buzzell. Camera: Leonard Smith. 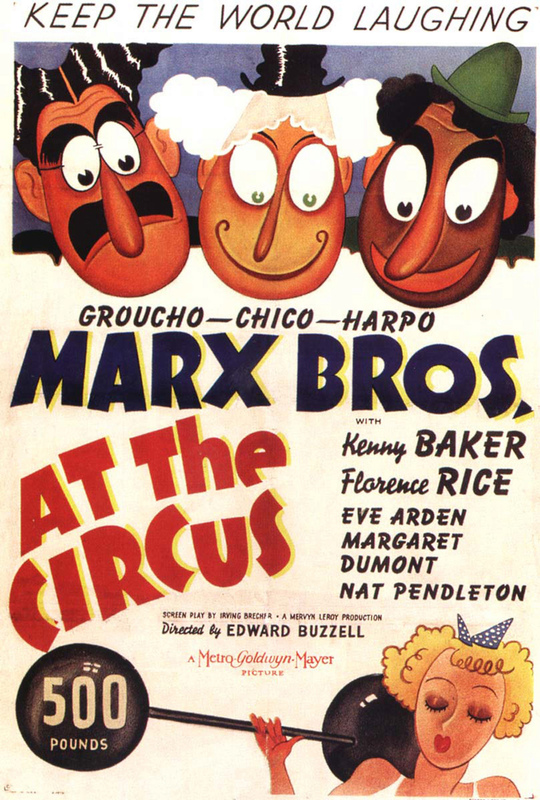 With Groucho Marx, Chico Marx, Harpo Marx, Kenny Baker, Florence Rice, Eve Arden, Margaret Dumont, Nat Pendleton. 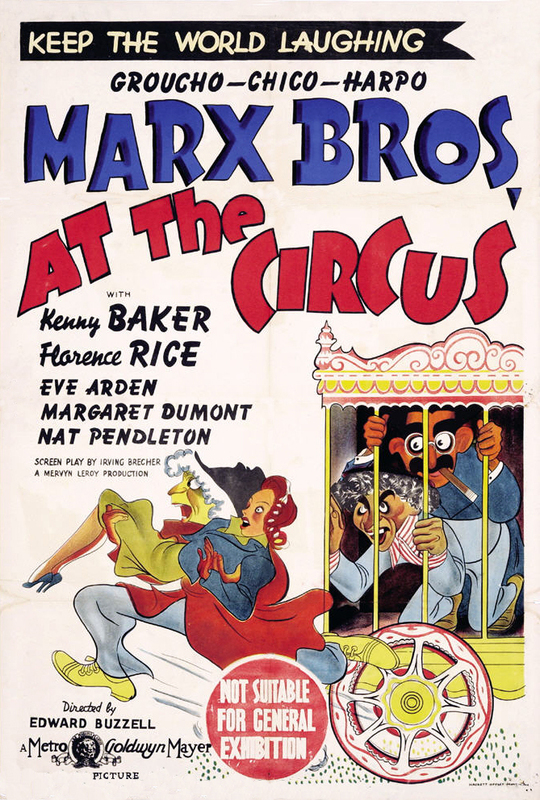 After a short stint with RKO, the Marxes returned to MGM for this film. 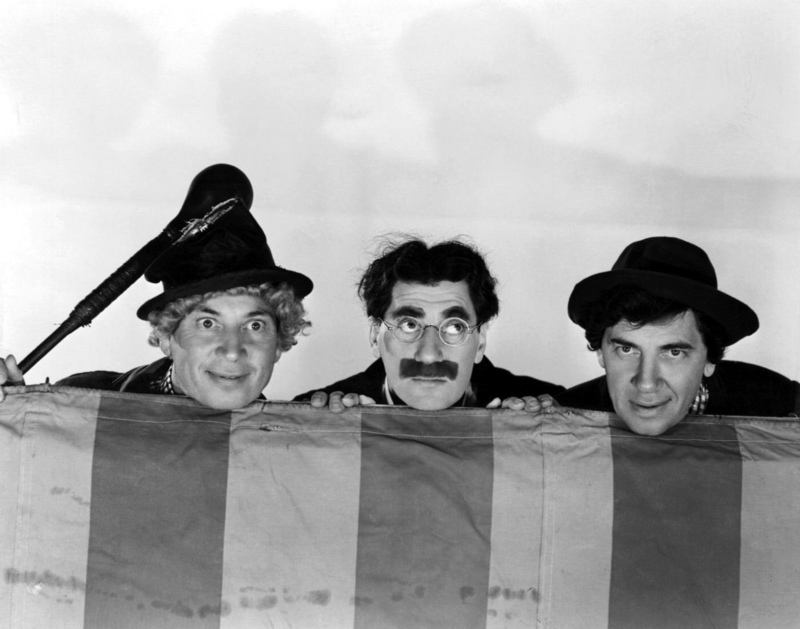 In his autobiography, Groucho And Me (copyright 1959 by Groucho Marx), Groucho mentions one aspect of this picture. There was a rather significant part in the film for an ape. Since they had no luck getting a live ape to play the part and had no desire to capture one and train him, they decided to hire an actor in an ape skin. It seems that not only did the actor have an agent, but the ape skin had an agent of its own. 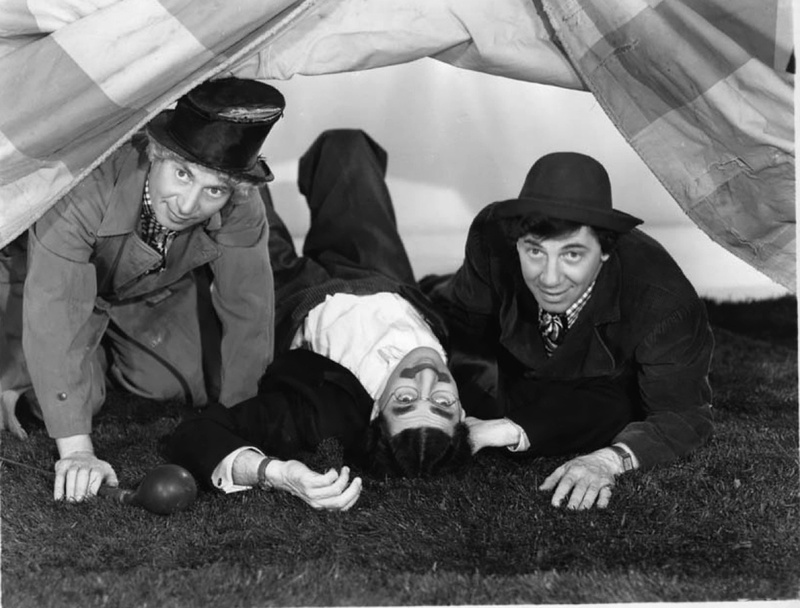 The problem arose that the actor couldn't get enough air in the skin and caused trouble by fainting in the middle of shooting. He tried to alleviate this problem by secretly punching holes in the costume. 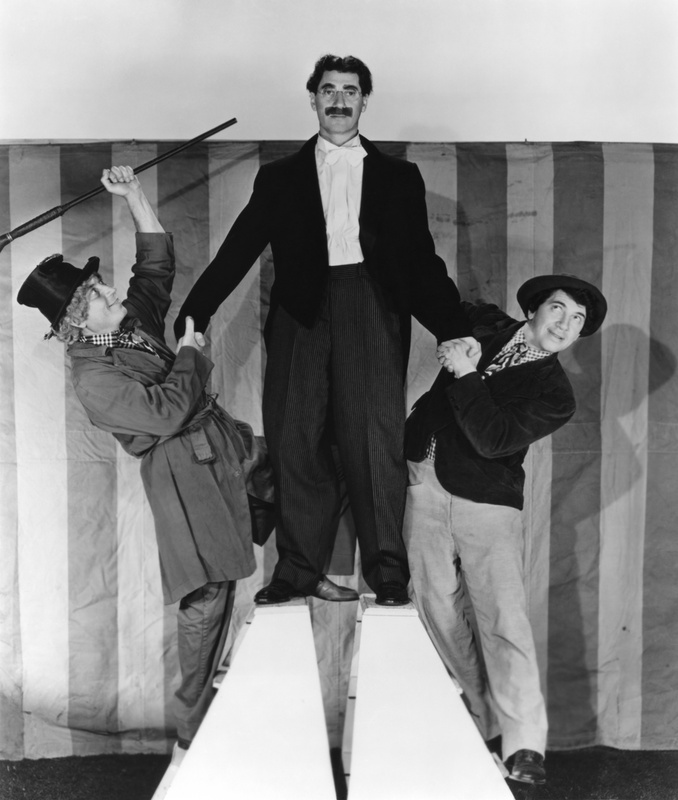 After a long period of shooting where the actor was performing without any ill effects, the skin's agent figured something screwy was going on, so he checked out the suit and found the ventilation holes. He stalked out of MGM with the skin over his shoulder, never to be seen again. After three days outside of a gorilla skin, the actor became uncomfortable and tracked down a man in San Diego who had an orangutan skin. Since orangutans are much smaller than gorillas, the actor couldn't fit into the skin and was replaced with a smaller man who had made a name for himself playing orangutans in the San Diego area. 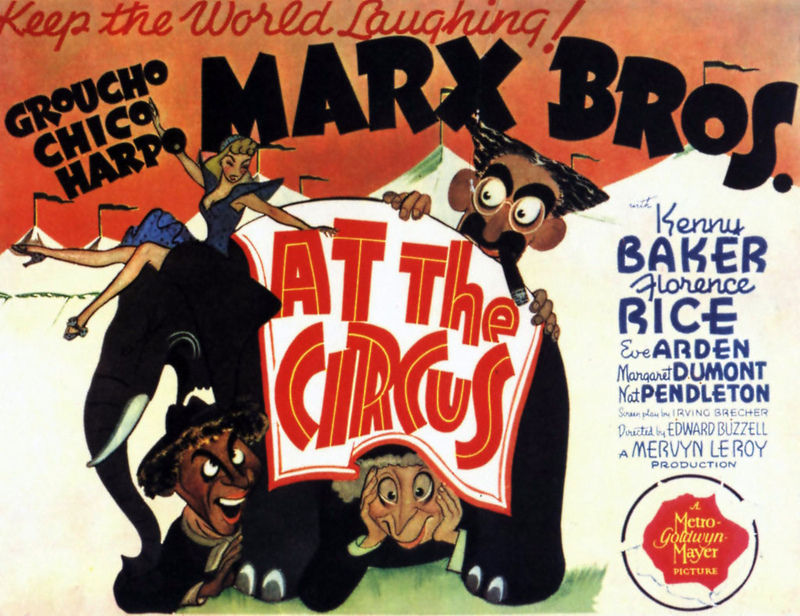 Thus, there are actually two apes in At the Circus. 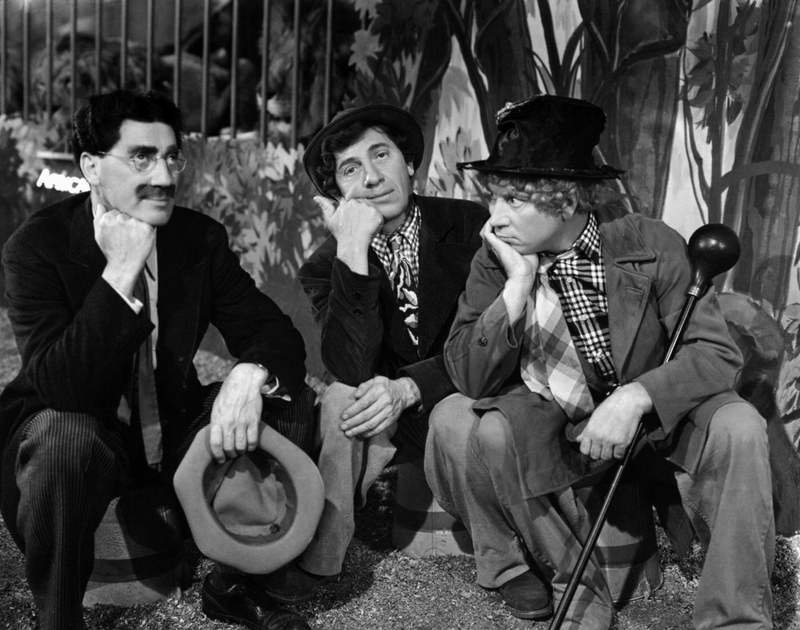 Groucho goes on to talk about the reviews of the picture: "At the first preview nobody mentioned us. Our gifted performances went for naught. The audience had eyes only for the gorilla. 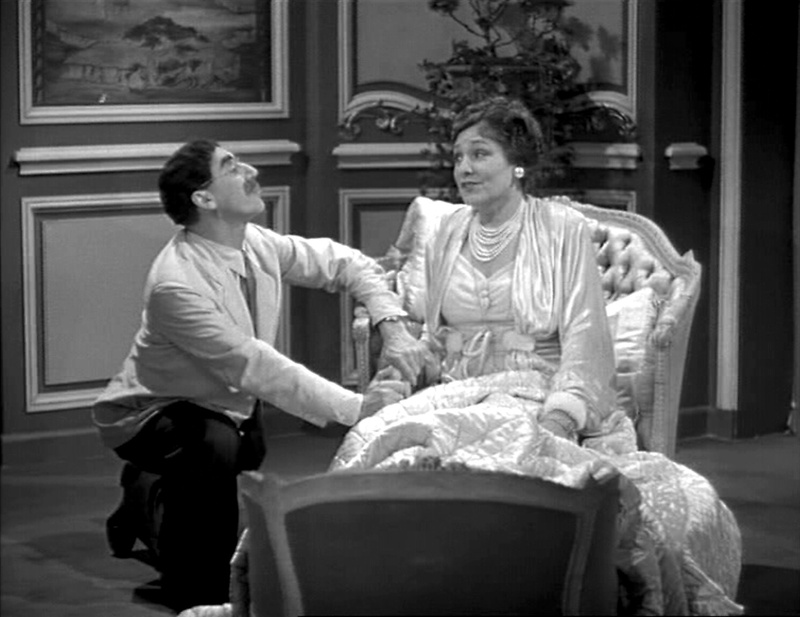 But overcritical viewers complained that in some scenes the gorilla seemed to be larger than he was in others, and that this had definitely weakened the credibility of the love story. 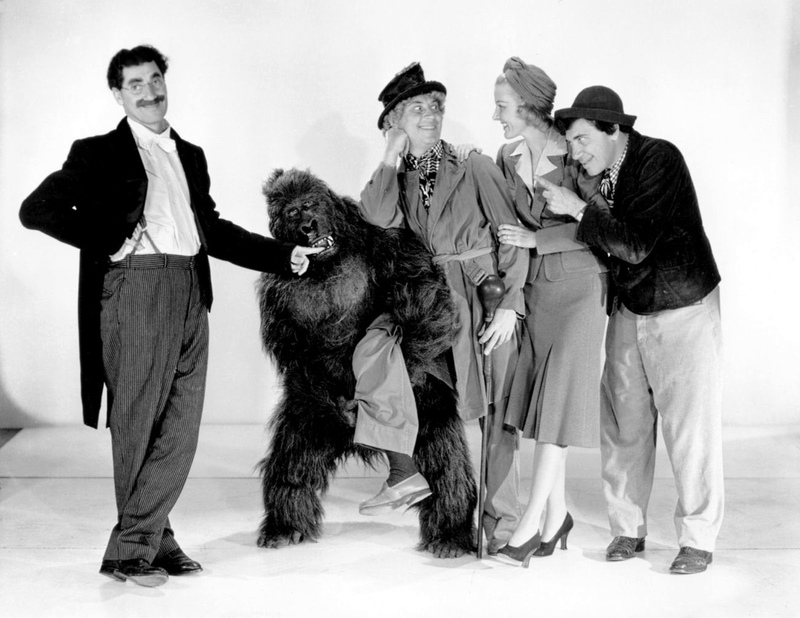 Later, however, when the picture was released, the theaters were obliged to refund the price of admission to many gorilla aficionados who complained that they had paid not to see the Marx Brothers but to see a full-sized gorilla, and instead they had been slipped a shrunken ape." On to the actual picture. 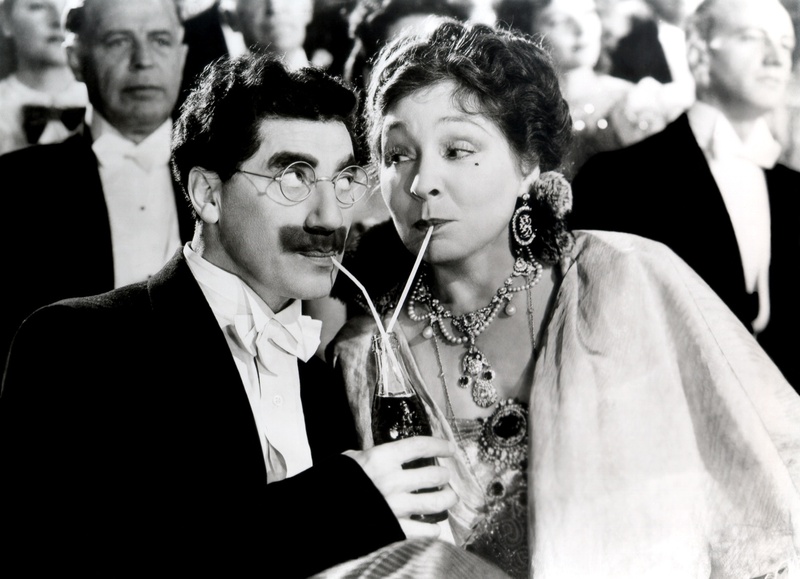 Circus owner Jeff Wilson (Kenny Baker) has been disowned by his wealthy aunt, Mrs. Dukesbury (Margaret Dumont). 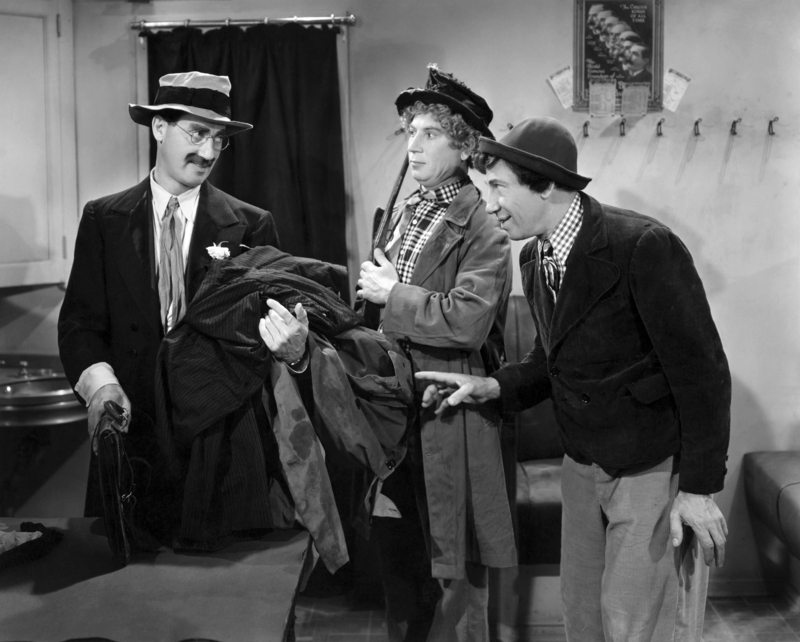 He is having financial trouble so one of his employees, Antonio (Chico) sets out to hire Attorney J. Cheever Loophole (Groucho) to help out. Loophole arrives only to find that the $10,000 Jeff was going to use to pay off part of his debt to John Carter (James Burke) has been stolen. 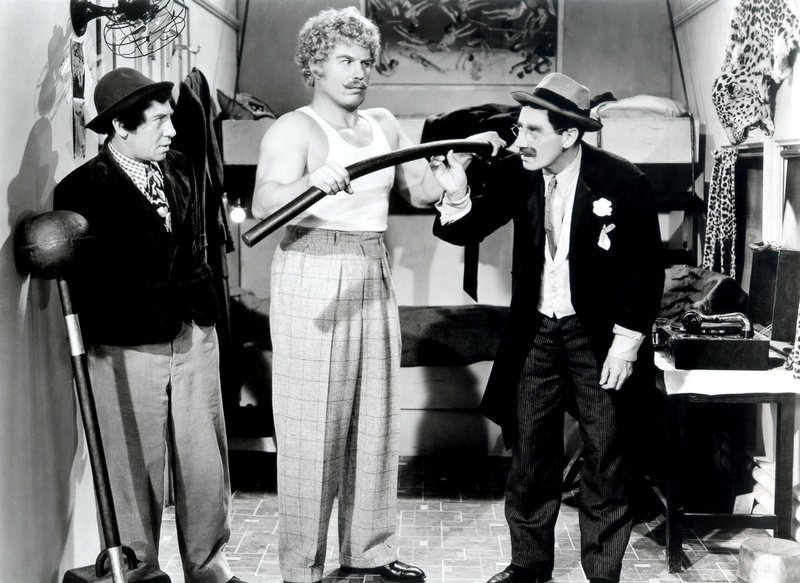 With the help of Antonio and Punchy (Harpo), Loophole tries to uncover the thieves and return the dough to Wilson. As a backup plan, he sets out to squeeze the ten grand out of Mrs. Dukesbury on the sly. Poster artwork courtesy of Gunnar and Gary. Additional photos courtesy of Gary.